When we had our house renovated, we rented a small bungalow at the back of our old house. Since we had limited space, all my dumbbell and barbell weight plates were relegated on the floor in a small corner in the rented house. On top of them were all the other stuff that we boxed in cartons. Because I had to lay off my workouts, I quickly forgot about those dumbbell and barbell weight plates. Little did I know that the house we were renting had roof leak problems. When it rained, rainwater managed to seep and trickle down the walls where we had our boxed stuff. After about 6 months and a flood disaster at the rented house, the new house was finished and it was time to move back. I was surprised with the barbell and dumbbell plates that I stored away and forgot about. Here are a couple of my weight plates that have badly rusted in the six months of storage. So, how do you get the plates back to looking like new? Disposable Cups - for paint and rust converter. If pitting has occurred, you may have to use a steel brush to remove the dirt and rust. 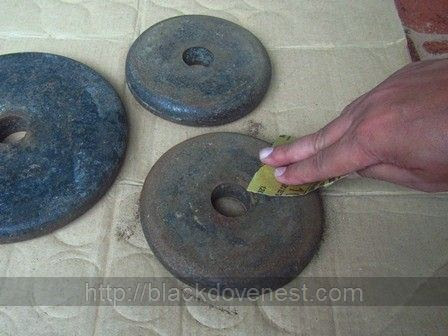 For light to medium rusting, use sandpaper (#80 - #100) to lightly sand the weight plates. Don't forget to sand along the rim and inside the hole if there is rusting there. There's no need to get all the rust out. It's only the heavy and thick rust that needs to be removed. Wipe and clean the plates with a dry rag. Don't worry if the plates look completely brown after wiping them with the rag. After light sanding, the dumbbell and barbell weight plates will look something like this. Rust Converter may be bought in any hardware store. It is a clear water-like liquid. The brand I used is "Bronco". It is a thin metal surface preparation, which when applied to rusted metal, changes the rust to amorphous iron phosphate. A liter of this chemical is about $3 and goes a long way. 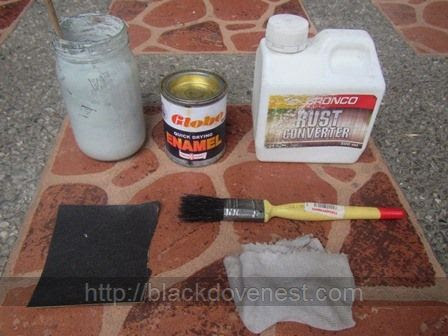 Pour a little of the rust converter chemical into a small container like an unused coffee mug. 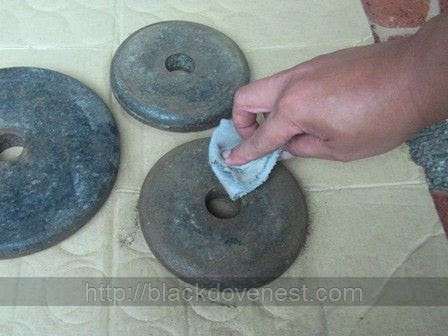 Dip a paintbrush and apply completely on the dumbell and barbell weight plates as shown below. Don't forget apply the chemical on plates' outside rim as well as the inside of the hole. After curing (usually overnight), this produces a hard grayish surface that serves as a solid base for primers and paint to firmly adhere. The plates below show the grayish surface on the weight plates. Or you could use paintbrush to apply the paint. 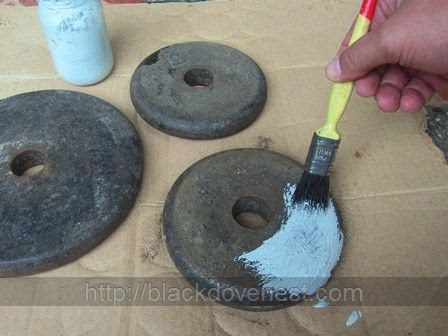 Spraying the weight plates with a "rust-stopper" enamel paint gives the plates a more even sheen and eliminates brush stroke marks. For an even tougher and more durable finish, you could apply epoxy paint. Popular brands are Guilder and Sphero. 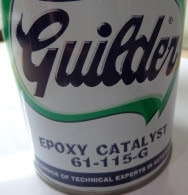 Epoxy paint comes with a base and catalyst. 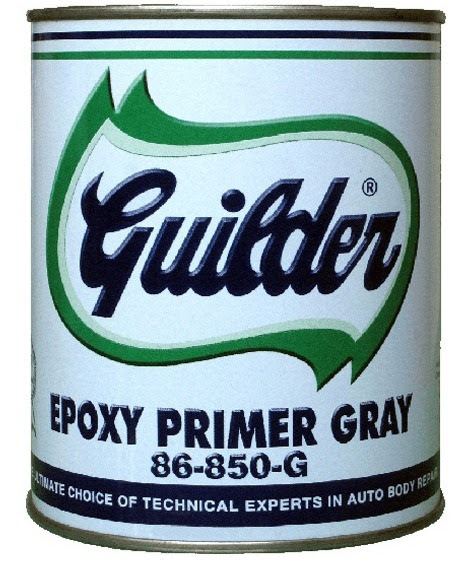 Mix these 2 parts as instructed on the label and apply immediately as the ready epoxy paint has a quick setting time. Here are the newly refinished plates that have been spray-painted and set on a homemade dumbbell and weight plates rack.